Calgary police helped a mom explain to her skeptical six-year-old why he still has to use a car seat. Joshua Abote hates sitting in his car seat, and was certain that when he turned six he'd get to upgrade to a booster seat like his older siblings — but unfortunately on his birthday he still fell short of the weight requirements. "I think he's at an age where he's pretty much tired of being considered the baby of the family," said his mom, Onai Petra Abote. "He thought that turning six would automatically change all of that, and when the birthday came, obviously the car seat didn't change." CALGARY OPINION | Calgary now has 202 neighbourhoods: Should we get rid of some? Kids under six — or who weigh less than 40 pounds — are required by law to use a child safety seat in Alberta. Joshua wants to be a police officer when he grows up, so when he kept bugging his mom and asking why he still has to sit in a car seat, she decided to invoke the letter of the law to keep him in line. "I said, 'OK, I'm going to ask the police because I want to keep him safe and obey the law. I mentioned the police just to get him off my back," she said with a laugh. Initially, it was a joke, but after he wouldn't let up for about a month, she decided to reach out to Const. Mark Smith, who often engages with Calgarians on social media. A few days later, a letter arrived in the mail. "When I saw the letter I was like, 'oh my gosh Joshua, you received mail from the police, what did you do?'" Abote said. "He was really anxious and then we opened it and I read it to him and he was so happy." "Unfortunately, so as not to get your mother in trouble with police, you have to help her out by using your big car seat," Smith wrote. "Perhaps one day you may be a police officer or firefighter and therefore it's important to remain safe when travelling in a vehicle." Smith thanked Joshua for his role in helping keep the community safe — and sent the future officer a "police helper" badge, to boot. 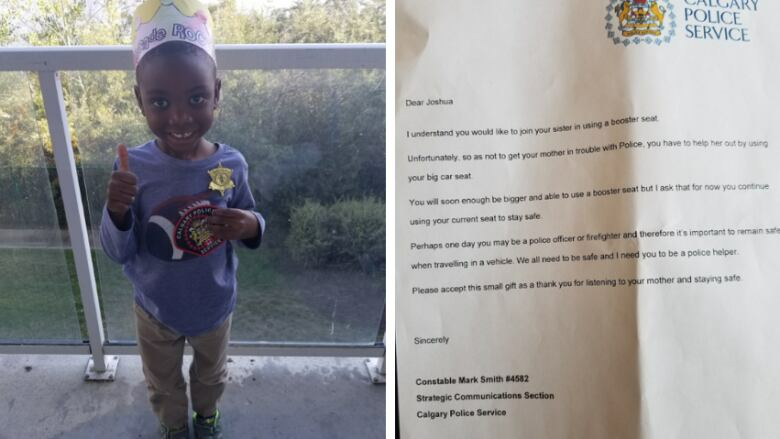 The only person possibly more excited to receive the letter than Joshua was his mom, who hopefully won't have to argue about car seats with her son again — or at least not until his next birthday.